Well I missed it! I walked inside my house to get a drink last Saturday evening and a Barred Owl decided to fly right over my deck at the same time. My husband Jeff, my sister, and her husband were all outside getting some great views of that awesome owl. Oh well better luck next time for me :-(. 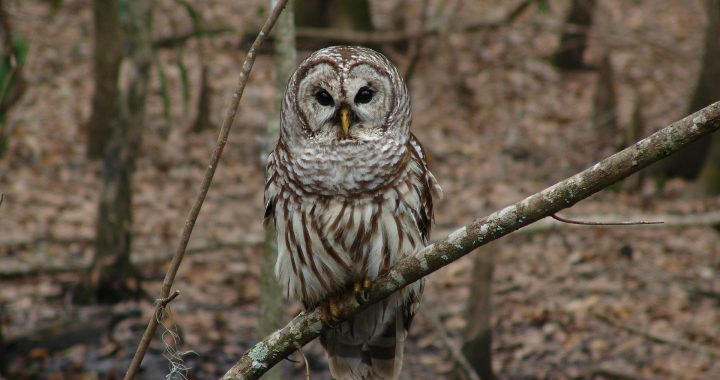 Where are Barred Owls? Barred Owls are a pretty common owl found around woodlands in the eastern half of the United States and Southern Canada. This owl has also made its way into the northwestern parts of the United States too such as in Oregon and Washington. My husband and I happen to live in a subdivision that has some areas with woods but they do not surround us. So if you have a wooded area near your property you may have them around too. How do you know if they live around you? The best way is to observe in the evening hours as we did this past weekend. It was about eight o’clock when the owl flew over our house. They like to feed at dusk so it was probably out hunting for its next meal. They can also be seen at dawn hunting for food too. When feeding, a Barred Owl will generally be perched up in a tree watching for its prey which is small mammals. So check out the trees in the early evening or early morning hours because you may see one there too. Another way is to listen for them. Just this morning around six thirty I heard a Barred Owl calling. It sounds like it is saying “WHO COOKS FOR YOU! WHO COOKS FOR YOU ALL!” and sometimes it can sound pretty creepy especially when it is late at night. Although they may also call during the daytime. Just a side note….the first time that I heard one we had just moved to a house on some acreage and surrounded by woods. I was in my bed sleeping with the windows open and heard a most unusual sound. I sat up in my bed with my eyes wide open (so my husband claims) terrified of what the heck was outside my window. Barred Owls are brown to grey in color with barring on their chest. They have a pale face with a hooked yellow beak and brown eyes. They are about sixteen to twenty-five inches in length (adults) with a thirty-eight to forty-nine inch wingspan. They range from one to three pounds with the female about thirty percent heavier than the male. This owl eats small mammals such as squirrels, mice, voles, rabbits, smaller birds including owls, chipmunks, and will also eat amphibians and reptiles such as turtles. Barred Owls grab their prey with their talons ingesting the whole animal. The undigested parts are regurgitated into pellets. This is another way to find owls. 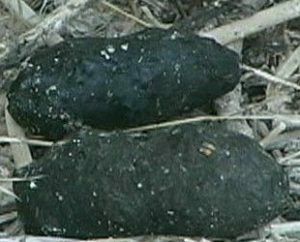 You may see these owl pellets at the bottom of trees or high perch which could be a favorite spot of the owl that you could check out later. Songbirds, crows, and woodpeckers will sometimes mob Barred Owls. They band together to try to shew away the owl because it is a predator. That is another way to find Barred Owls too. 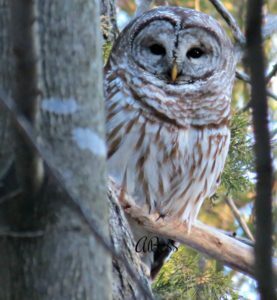 If you happen to be hiking in the woods and hear a bunch of crows, blue jays, wrens, or chickadees carrying on in a particular tree, check it out because you may see a Barred Owl in there. Of course you may also see a hawk because these birds do the same thing to them too. Barred Owls mate for life. During their mating ritual (sometime around January) the pair will be bobbing and bowing their heads as they sit perched close to each other calling in a duet. Nesting is usually in a hollow tree or that of an old hawk’s or squirrel’s nest. They may use the same nest year after year. They only nest one time per year with two to three eggs. Only the female sits on the nest which can be from twenty eight to thirty three days. When the young are born they are covered in down and almost immediately start begging for food. 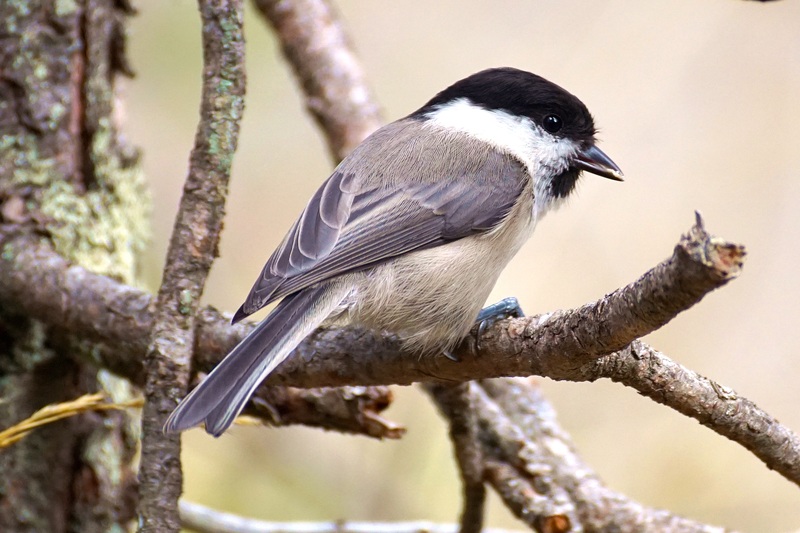 The young will leave the nest at about four to five weeks but will remain close by perching on branches until they are able to fly at around ten weeks. They will stay with their parents up to about four to six months. Sometime early in the fall the young will leave to be on their own. I am thinking that we saw a juvenile flying over last weekend because they usually tend to come in closer to humans. Just rookies you know :-). Predators of the Barred Owl are the Great Horned Owl, Northern Goshawks, raccoons, and weasels. As mentioned earlier, the Barred Owl has made its way outside of their eastern United States range into the northwestern parts. In places such as Oregon and Washington they have become invasive. 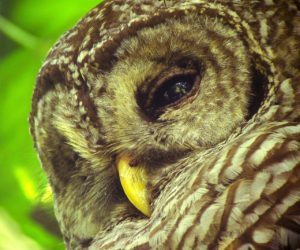 Barred Owls have moved into the Spotted Owl’s territory and because the Barred Owl is more aggressive have put the Spotted Owl in decline there. The Barred Owl is a fascinating owl that you will find near woodlands mostly on the eastern half of the United States and Southern Canada. You will know one is around when you hear their very vocal call “WHO COOKS FOR YOU!….WHO COOKS FOR YOU ALL!” Or you may also see one perched in a tree near a wooded area as it hunts for its next meal…a small mammal or bird. This time of year is when the young start to go out on their own so it is a good time to see one either at dusk as we did or at dawn. So keep an eye or ear out because you may get to see one of these beautiful owls near you. Posted in Backyard Birds, Owls, Raptors Birds of Prey and tagged barred owls, owls.